This area of gentle hills and honey-coloured stone villages between Bath and Stratford has some of the finest walking in England. Thanks to well-maintained footpaths and the nature of the landscape, the walking is well within the capabilities of everyone. This route takes you through the heart of the romantic Cotswolds. 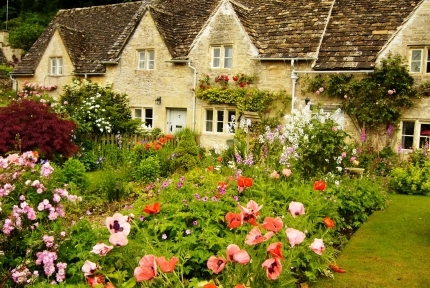 Starting in the fine Regency town of Cheltenham, you will walk to Winchcombe, Broadway and Chipping Campden. Then walk to the town of Morton-on-Marsh, Bourton-on-the-Water and finally, back to Cheltenham. The chief glory of the area lies in its villages - gems of vernacular architecture that developed out of the wool trade and which have survived unspoiled into the 20th century. The countryside is a happy compromise between man and nature; marvelous views from the Cotswold escarpment, some of England's finest churches, country houses, Neolithic barrows, ruined abbeys, gothic follies, magnificent gardens and even a substantial industrial heritage - all best seen on foot. Between these delights, you'll find plenty of good pubs serving excellent food and local beer.